Recently there was a large scale search and rescue operation that happened off the coast of Woodman Point. Volunteers spent two full days searching for 4 people and 1 boat which was overdue back to the boat ramp. Hannah Barry, from WAtoday, interviewed and compiled a very well written news article about the operation. The Whitfords Volunteer Sea Rescue Group has a new, fully equipped four-wheel drive ute to support its marine safety activities. Thanks to Quadrant Energy for its grant, which enabled the purchase of the vehicle and equipped it to carry emergency equipment and operate on the radio system. BOATIES are risking their lives when they go out on the water without logging on with a volunteer sea rescue group. Already this year, Whitfords Volunteer Sea Rescue Group has saved three people’s lives. Whitfords Volunteer Sea Rescue Group has a 24/7 radio service, with the Ocean Reef tower manned every day from 7am to 6pm and home-based operations in two shifts – from 6pm to 11pm then 11pm to 7am. 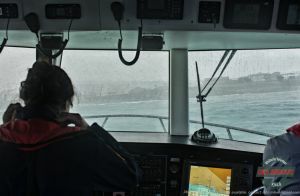 With about 120 volunteer members, the group covers the coast from Alkimos to City Beach and about 50km out to sea, performing about 250 rescues a year.